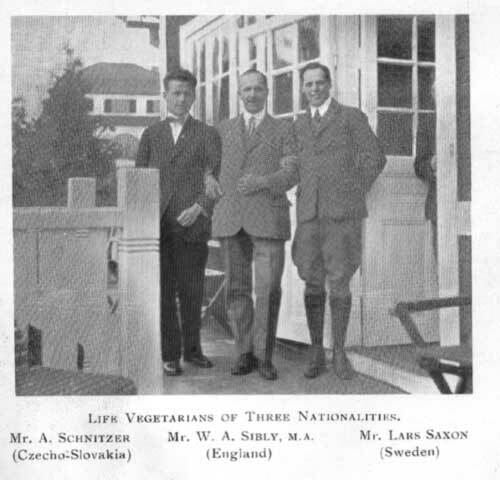 By the kind invitation of the Swedish Vegetarian Society the 5th annual Vegetarian Congress will be held at Stockholm from the 19th to the 21st May, 1923. Reports will be given by all the delegates of Societies which are members of the International Vegetarian Union, and papers read on all aspects of the vegetarian movement. There will also be an Exhibition of Vegetarian specialities, literature, etc. 'The arrangements are in the hands of the Swedish Vegetarian Society, and all communications respecting papers, etc., should be sent to its president, Mr. J. L Saxon, Lästmakeregatan 12, Stockholm, who will also he helpful to intentding visitors. Miss Hompes, 26 Denham Street, C-on-M, Manchester, is the General Secretary. There is no vegetarian hotel at Stockholm, but there are several good temperance hotels and also some vegetarian restaurants. The cost of the double journey will be from £23 to £29 for travelling, not including hotel expenses. At 11 o'clock on the morning of the 19th May, the Conference was formally opened in the commodious room of the Christian Association Hall, by the president, Mr. J. L. Saxon, of Stockholm. After extending a hearty welcome to all, he called upon the Hon. Congress Secretary, Madame Lombard (Stockholm), to read the Roll Call of the Delegates. Each rose as his or her name was called. 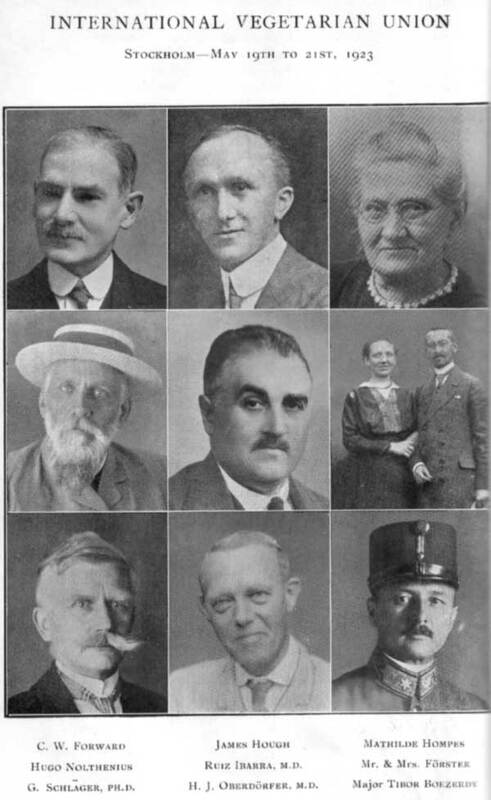 The following is a full list : America (South) - Dr. Ruiz Ibarra ; Denmark - Dr. Carl Ottosen (Head of the Skodsborg Sanatorium), Oluf Egerod and Margerethe Noll, Copenhagen ; England - Miss Mathilde Hompes (Editor of Vegetarian Messenger, General Secretary of the International Vegetarian Union), Manchester ; W. A. Sibly (Headmaster, Wycliffe College), Stonehouse, Gloucestershire ; James Hough (Secretary of the Vegetarian Society), Manchester Henry B. Amos (General Secretary of the Vegetarian Cycling and Athletic Club) London ; Charles W. Forward (London Vegetarian Society) ; Finland - Mrs. Anna Kurimo (Secretary of the Finnish Vegetarian Union) and Miss Ante Kurimo, Uleaborg ; Holland - Professor Hugo Nolthenius (President of Dutch \/egetarian Society), Laren N.H. ; India - M. Dayal, M.A., Oxon ; Norway - O. J. Selboe, Skögen, Director O. Olvik, Furuly Helsehem, Stord ; Portugal - Capt. Antonio Cavalho Brandao ; Spain - Dr. Ruiz Ibarra ; Switzerland Dr. Oberdörfer ; Germany - Dr. G. Schläger (President of German Vegetarier Bund) ; Georg Förster (President of Vegetarier Verein) and Frau Martha Förster, Dresden ; Czecho-slovakia - Moriz Schnitzer (Union of Nature Healers and Adalbert Schnitzer, Warnsdorf; B. O. Dürr, Komotau ; Karl Micka, Deutsgabel ; Hungary - Major Tibor Boeserdy ; Austria - Richard Schwartz and Mrs Schwartz, Vienna. This was the day fixed for the Annual Meeting or the Swedish Veg-etarian Society, to which all the delegates and visitors were invited. At conducting a brief business meeting for the National Society, the proceedings of the International Congress were continued. 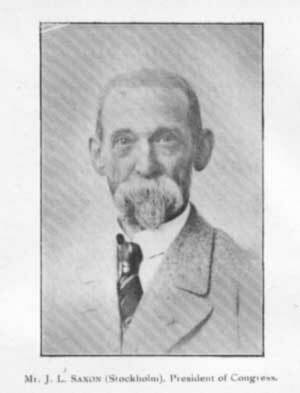 Mr. H. B .Amos (London) on " Diet for Strength," Ernest Axon "Seventy-five Years of the Vegetarian Society," Oscar Bünemann "Report for Esperaritist Vegetarian Society." Capt. Antonio Cavalho Brandao on " Vegetarianism in Portugal." C. De Clerq "The Miracle of the Sun," Dr. D. R. Har Dayal on " Vegetarianism in India," Josef Drahovsky " Report for Hungary," Oluf Egerod " Report for Danish Vegetarian Society," C. W. Forward (London) on "Vegetarianism and its Basis of Scientific Truth," Georg Förster on " The Work Done by the German Vegetarier Verein," Mrs. Martha Förster on " The German Women's Vegetarian Union," - Halsingar "Report for National Vegetarian Society, U.S.A.," Mathilde Hompes " Report for International Vegetarian Union," James Hough (Manchester) on " Methods of Propaganda," Dr. Ruiz Ibarra on "Nature Cure," Anna Kurimo "Report for Finnish Veget-arian Society," Hugo Nolthenius " Report for the Dutch Vegetarian Society," Dr. Oberdörfer (Switzerland) on "The Goal of Man," Dr. Olvik on "Sanataria in Norway," Dr. Ottosen (Copenhagen) on " The Digestion in the Intestines," J. W. Rose ''Report for Vegetarian Publishing Company, New York," Dr. G. Schläger, of the German Vegetarier-Bund, Moriz Schnitzer on "The Nature Healing Institutions in Germany and Austria," Byrachef O. J. Selboe for the Norwegian Vegetarian Society, W. A. Sibly on "The Work Done at Wycliffe College" (with lantern slides), Rev. Walter Walsh " The Ladder of Life," Frank Wyatt " Report for London Vegetarian Society." 1. England (co-operatively from the Vegetarian Society and the London Vegetarian Society). 2. From Switzerland, but its delegate, Dr. Oberdörfer. was willing a let it stand over to the next Conference but one. He pointed out that Switzerland is the centre of Europe and a Federation. The General Secretary should issue a short bulletin every three months. ELECTION OF OFFICERS. President : According to the Constitution Mr. Ernest Bell becomes the President for the period from this Congress to the end of the next. A hearty Vote of thanks was given to the retiring president, Mr .J. L. Saxon and he was unanimously elected 'President Emeritus for Life with consulting and voting power.